In April I tried to give now former Cubs closer Kevin Gregg a chance to prove himself. But instead by June he validated all of my original concerns – the guy just isn’t a “winning” closer. He has given up 12 home runs in the closer role, for an average of a hefty 1.9 per 9 innings pitched. That is giving up home runs in almost 20% of the innings he pitches – in the closer role. Not acceptable for a team with designs on post-season play. These numbers are very close, but are not acceptable for a winning team. The Sporting News ranks Gregg at #24 and Wood at #26 for relief pitchers in the MLB this year. That means almost every other team has a better closer option – some two – than Kevin Gregg or Kerry Wood. I think Carlos Marmol deserves to be given the ball in the 9th and try to keep the gig. His stuff is un-hittable if he throws strikes. So maybe Lou keeps him on a short leash and pulls him if he obviously can’t get the ball over on a given night. Or maybe he rises up and takes the role he is destined for. Angel Guzman has been outstanding this year and deserves the set-up role. He has electric stuff and can get the ball to Marmol. I just don’t think he has the big league experience to take on the closer role just yet. He’s not battle tested. 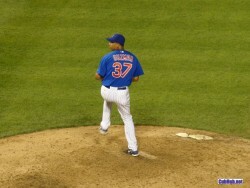 That said, if Marmol flounders, maybe it’s Guzman or Sean Marshall that shuts the door. This will have to be a trial and error situation for Lou as the regular season winds down. If Lou doesn’t guess right, or if no one steps up to be the closer, then the playoffs won’t matter anyway – it will be wait until next year again.